Playing doctor – are self-help online health sites really effective? I’m a wreck. I think I might have osteomyelitis, or peripheral neuropathy, or even retrocalcaneal bursitis. I just hope it’s not tarsal tunnel syndrome. I’m also overstressed, overweight, losing my hearing and not sleeping enough. Even worse, I have a low IQ and my “real” age (taking into account my bad habits and so on) is 10 years older than my actual age. Who needs doctors anymore? We’ve got the Web. Yup, I learned all this stuff from visiting online health sites. There are dozens of them out there, and they all promise to help figure out what ails you. Of course, they all feature prominent disclaimers emphasizing that they should be used for information purposes only and you should see a medical professional for any real diagnoses. But why bother? Even if you could schedule an appointment within the next three months (by which time the symptoms have usually disappeared … or you have), it’s much easier to type in few search terms or answer a few questions and get a list of potential causes of your symptoms. No kidding. If I didn’t suffer from anxiety before, I surely do now. Later, I’m going to take an online test to be certain. But I cheated. I know what I have, because a doctor told me. So I confess, I don’t really believe I might have all those conditions listed above — but I might have believed that if Doc hadn’t told me I had plantar fasciitis. That’s medical-speak for a strain of the fibrous tissue that runs along the bottom of the foot from heel to toe. So, to gauge the effectiveness of online health sites, I used that example to focus on “symptom checkers” that typically let you indicate what part of the body is causing you problems and answer some questions to narrow down the list of possible causes. The results weren’t very encouraging. Some sites winnowed possibilities down to a manageable number that included plantar fasciitis, as shown in the video below. But some didn’t. And the logic underpinning the decision-tree process sometimes seemed absurd. Being a layperson (with a low IQ, remember), I asked some bona-fide medical professionals to take a look at the sites and provide their assessments. Helping me analyze the symptom checkers were Dr. Laura Beaty, a family practice physician at Alliance Primary Care in Atlanta; Dr. Andy Spooner, a general practitioner with a specialty in pediatrics at Cincinnati General Hospital; and Dr. Viren Bavishi, a pediatrician at Wheaton Franciscan Healthcare in Franklin, Wis.
Dr. Beaty and Dr. Spooner took my approach and worked through each of the sites to evaluate them individually. I conducted my own analysis before speaking to them. My take: This is probably the most popular health-related site on the Web. Google ranks it No. 1. But I found some of that aforementioned absurdity here. 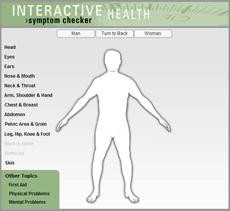 Upon landing on the symptom checker page, I was presented with a list of 76 possible symptoms or an interactive map of the human body that lets you select the bothersome part with a mouse hover. I was then given a list of 21 possible conditions. A series of questions ensued, designed to zero in on the most probable cause. Is “sharp” that much different from “stinging”? It turns out it didn’t make any difference what answer I chose — the end result was the same for every path I took through the process. WebMD’s symptom checker gave me the same 15 results no matter how I refined my answers. Starting over and choosing the option to “finish” after the first question — the pain description question mentioned above — I was immediately rewarded with a list of the same exact 15 possibilities, but in a different order. I started over yet again and chose “don’t know” or “none of the above” for every single question, and yes, I got the same exact 15 possibilities. So after choosing “sole” and “pain or discomfort,” there was apparently no result possible other than the 15. Except for one. The only way the list changed was if I indicated that I had suffered a catfish sting. Choosing option No. 2 added — you guessed it — “catfish sting” to the list of possibilities. So if your sole hurts and you recently tangled with a catfish, you’re told that the cause of your pain could be a catfish sting — or 15 other things. Conditions rounding out the 15 ranged from multiple sclerosis to poorly fitting shoes. Gee, thanks for narrowing it down. If you decide to click on each of the 15 items to get detailed descriptions and try to pinpoint your problem, I hope yours isn’t No. 15 on the list. WebMD does contain plenty of good information and services and looks like it could be quite useful, as do all the other sites. But for quickly and easily figuring out your specific problem through the symptom checker, not so much. Physicians use a similar tool, he noted, that might come up with 200 possible causes, compared to the much smaller number offered by WebMD and some of the other sites. That helps him consider diseases that he might not otherwise have thought of. He said the professional tool also makes it easy to add many different symptoms and combine them in various ways to reach this large number of possible conditions. My take: Here you’re greeted with a standard (if rather ape-like) interactive human body map. But it operates a little differently. Clicking on “Leg, Hip, Knee and Foot” and then “Toe, Foot and Ankle Injuries” brings up an overview page with all kinds of possibilities, some of which are categorized as “acute injury” or “overuse injuries.” There are eight main acute possibilities and five under overuse, with plantar fasciitis No. 4 under overuse injuries. But scroll down and things get weird. Another asks “Is an object, such as a nail, embedded in your toe, foot or ankle?” Answering “yes” brings up a page telling you how soon you should contact a medical professional. I don’t know about you, but if my foot is stuck in a pipe or has a nail sticking out of it, I’m thinking my first impulse isn’t to go online to see what the problem might be and what I should do about it. I’m pretty sure I could muster up an accurate self-diagnosis here. Revolution Health’s symptom checker starts with the standard body map, but it’s more educational than diagnostic. Dr. Spooner noted that although the site offered limited combinations of symptoms, there wasn’t a “blank box” where a second symptom could be typed in. He used the symptom “headache” to go through the checker and observed that if a child had a headache, there was no way to add the symptom of diarrhea. “It’s quite necessary” to know if those two symptoms are being experienced at the same time, he said. My take: No interactive map here. It starts out with a list of 28 adult symptoms and 17 child symptoms. 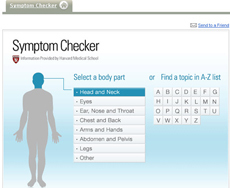 MayoClinic.com’s symptom checker starts with a list of symptoms rather than an interactive body image. That brought up seven probable causes and a list of associated factors for each (with your choices in bold). Only three of those seven were included on WebMD’s list. Plantar fasciitis was No. 5 on the list. Clicking on it brought up pages detailing its definition, symptoms, causes, risk factors and other information, similar to all of the sites. All combinations after choosing “heel” resulted in 11-item lists with just a few differences. There “weren’t a lot of choices” offered after entering the initial symptom, he said; although those offered “were some logical choices” that worked fine sometimes, in other cases a regular Web search would provide more information if a user searched for two different symptoms. 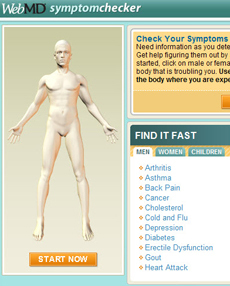 My take: Like most of the other symptom checkers I looked at, About.com features an interactive human body map. The site tries to be all chummy and personal, stating, “We’re sorry to hear you have foot pain!” and asking for forgiveness when it has to ask personal questions such as age and weight. It took me several tries through About.com’s symptom checker to find the correct condition from a list of possibilities. Because of confusing questions, I had to go through decision tree several times. Once I figured out the right responses, it took me seven questions to narrow down the probable cause to three conditions. Two of the three possible conditions matched WebMD’s list, with plantar fasciitis listed at No 1. The key was asking if I experienced pain after getting up in the morning and starting to walk around, after which the pain decreased greatly. That’s a classic symptom of plantar fasciitis. None of the other sites I investigated asked this crucial question. 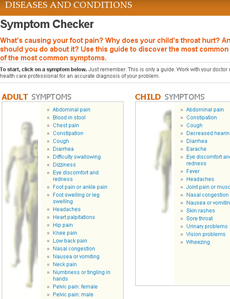 The site then offered the usual specific pages on symptoms, diagnosis, prevention, treatment and so on. Dr. Spooner’s take: He thought About.com allowed some combinations of symptoms, but it was more valuable as a “database of articles” rather than a tool to present a small number of possible causes through the decision tree. “It’s pretty much just a straightforward library of articles of high quality, with not a lot of ways to combine symptoms,” he said. If he was worried about a complex set of symptoms that presented a whole picture, “this [site] wouldn’t help me much.” As far as content, however, he said “it’s got great stuff” provided by Harvard Medical School. My take: I couldn’t figure out the point of this site’s name. It functions like the others in providing a symptom checker and many other kinds of information, and it includes a “Misdiagnosis Center” that lists commonly misdiagnosed diseases. But I couldn’t tell if its intent was to correct misdiagnoses or publicize the problem or what. 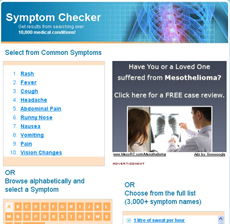 Anyway, the symptom checker boasts 10,000 medical conditions. It takes the list approach instead of an interactive map and lets you choose from common symptoms, browse alphabetically or pick from a full list of more than 3,000 symptoms. I went to the alphabetical section and clicked on “heel pain.” Sure enough, plantar fasciitis was listed as No. 5 of six causes. Three matched WebMD’s 15. Adding many different second symptoms didn’t result in any lists with plantar fasciitis. The mysteriously named WrongDiagnosis.com eschews the standard body image in favor of a list of symptoms. He said a search of headache and bowel problems resulted in 268 possible conditions. The other sites, he said, do “a good job of putting up different guardrails so you don’t go off on tangents.” But here, for example, a bizarre condition called “arctic bearded seal syndrome” came up in a long list of results from one search. “I don’t know how you would even process this,” he said. So here’s the summary of how many clicks it took me to get a list of possible causes that included plantar fasciitis. These are the shortest routes I eventually found to get to the end result, often after several earlier attempts where questions were confusing and I ended on a page with no plantar fasciitis. So About.com narrowed down the list to the fewest number of possible causes, but WrongDiagnosis.com got to its final list quicker than any other site. There were surprisingly few common possible causes among the sites. For my particular problem, About.com was the most useful because it asked the crucial question about initial pain experienced after getting up in the morning that decreases as you walk around. That’s a classic symptom of plantar fasciitis and really focused in on my condition. Your mileage may vary. Dr. Beaty’s general observations about symptom checkers were mixed. It’s not uncommon to see one or two patients a week with such printouts, she said. Patients coming in armed with information from the symptom checker sites are fewer, she said, averaging perhaps one or two a month. She agreed with the Microsoft report that Web searches tend to escalate patients’ fears. “Absolutely, just like when we were all in medical school, we all felt we had each thing that we learned about. It is human nature. Dr. Spooner said increased patient anxiety from Web searches has been going on for years, and in the pre-Internet days patients would come in armed with magazine articles. Even though he sees only hospitalized patients now, he said “it’s a pretty universal thing” for family members to bring in laptops and voice their concerns about possible serious conditions found on the Web. Dr. Bavishi said he probably experiences the cyberchondriac syndrome “once a week, if that much,” depending on the season and other factors. More often, he said, his patients’ family members consult Web sites while they’re waiting for a call back from a doctor or just before a doctor’s visit, a practice he encourages. Some of the problems he pointed out with consulting the sites first, he said, are that their navigation can be confusing, their content and advice varies greatly, some vital questions may be missed, and a patient’s “past and local history” isn’t taken into account as it would be with a physician. See below for a list of many other online tools available to give you information about your hearing, weight, health habits, “real” age, mental ability, psychological soundness and much more. I’m still worried about those. I’m off to my home computer to take that anxiety test — if I can dodge those pesky catfish. Note: For an expanded analysis of these tools, see David Ramel’s blog. FreeMD: Uses video to present a real-life doctor who asks you prerecorded symptom questions. JustAnswer: Claims to have doctors and nurses (“subject to a rigorous screening process”) online NOW to answer your questions for a fee. Mental Health Screening Center (Depression and Bipolar Support Alliance): Confidential online tests for depression, mania and anxiety. Exercise Counts (American Cancer Society): Discover the calories burned in a workout or ordinary daily activity. Drug Interaction Tool (PDRhealth): Enter any number of medications, and it gives you possible side effects of different combinations. Over 40 vs. Alzheimer’s (Over40andfighting.com): A memory test in which you click on tiles that flip over briefly to reveal different shapes; try to match all the shapes in fewest number of attempts. RealAge: Asks a bunch of questions about habits, work, ethnic background, amount of sleep you get, height, weight, blood pressure, medications, how you drive and more, then displays your “real” age (requires e-mail address and password). MedlinePlus (U.S. National Library of Medicine/National Institutes of Health): Provides dozens of topics arranged alphabetically, pointing to several other sites where you can take tests and get information. Equal loudness contours and audiometry (University of New South Wales): Measure your frequency response range and compare your results to “standard equal loudness” curves. Hearing Test Products (Digital Recordings): Several tests with different numbers of tones used for calibration and measurement; produces interesting left-ear and right-ear graphs indicating your range of hearing. Audio Check: Measures certain aspects of your hearing ability; also lets you check your audio equipment’s performance. Test your sense of pitch (National Institute on Deafness and Other Communication Disorders): 26 familiar tunes are played; you click a radio button to indicate if they were played correctly or not. IQ tests are probably the most prevalent tests on the Web, but they vary wildly in format and results. Just Google “IQ test” if you want to venture into the maze. Intelligence profile (HealthForums.com): Posits the theory that people have different types of intelligences, such as bodily kinesthetic, logical-mathematical, musical and spatial, and indicates what types you may have. Jung Typology Test (HumanMetrics): Deals with personality types, not health per se, but fascinating all the same. Based on Jung/Myers-Briggs typological approaches to personality, a 72-item questionnaire determines your personality type. Tips and resources for small Canadian tech firms doing business in the U.S.